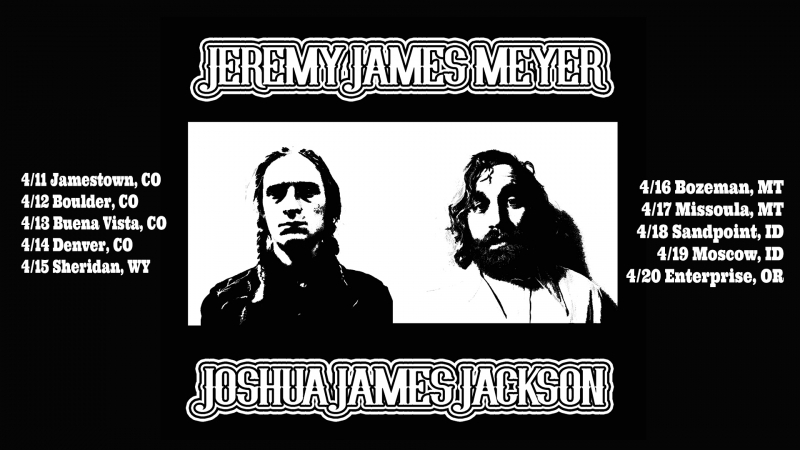 Jeremy James Meyer is a creator. Give him a pile of wood, and he'll craft you a table; offer him a town in the back country, and he'll sculpt you a carnival; hand him a life of experiences, and he will meet them with wisdom and wit, and leave us all a legacy of music and poetry--a legacy which is just beginning to unfold. Don't sleep on this cat. Jeremy is weaving himself into the tapestry of new American folk music with an understanding that belies his twenty-something years. Invite him to perform in your town, and months later, you will likely still be telling stories of the party that followed, kicking back on the new porch deck that he built for you the day of the show. Joshua James Jackson and his guitar share all the best stories and jokes, the highest highs and the lowest lows of life on the road. His songs are honest and bare, driving and fun. He begs the difficult questions like “do we do away with the dewey decimal system?” and just what does it mean to live the dream? For the last decade and a half, it’s been easy to find Joshua James Jackson onstage with a bass, a trumpet, or a guitar. Like a good recipe for chicken JJJ has toured nationally and internationally as a sideman in some of California’s finest bands including The Sam Chase & the Untraditional, The Brothers Comatose, Frankie Boots and the County Line, and the Crux. Since 2015, JJJ has been piloting the jazz punk outfit Sharkmouth. Nevada Sowle and Cooper Trail are some of the roughest, toughest musicians on the west coast- maybe you've seen them with Bart Budwig, Maita, or Caitlin Jemma somewhere. They'll be providing musical accompaniment on both of these songwriter's sets.